Last week we wrote about how the nature of transportation in China is changing. In this second article of the series, we’ll take a closer look at China’s high-speed rail systems, and how they’re contributing to this shift. Railroad development has, and is, a fundamental part of economic expansion; it allows for the vital transport of people, linking of economic districts and drives regional investment. It is therefore unsurprising that China hosts the world’s second-largest railroad system and has now constructed the largest high-speed rail network (HSR). HSR is defined as a rail system designed for consistent travel speeds of over 200 km/h, and it been hailed as a much more sustainable and efficient form of rapid mass-transit than its automotive and airborne counterparts. While the rest of the world frets over concerns of cost and safety, China is plowing ahead with plans to extend the already enormous infrastructure for HSR. Lines are being expanded from the major routes to connect the smaller urban centers, with plans to eventually connect every city with a population of at least 500,000. This explosive development has taken place all within the past decade, and it’s having a huge impact China’s transportation system. The idea for HSR in China hails back to 1990 when the Ministry of Rail introduced a proposal to connect Shanghai and Beijing by HSR. Development was halted at first due to a debate over whether to use maglev technology for the system or conventional lines. But despite Shanghai’s development of a ­maglev line in 2000, the State Council adopted conventional track HSR for the Beijing-Shanghai line and three others in 2004, ending the debate. In 2006 China announced a very significant plan to build passenger-dedicated HSR lines, complementing their efforts to upgrade existing conventional lines through the “Speed-Up” campaigns. Although ambitious at first, government investment exploded in 2008 through an enormous stimulus package, worth $300 billion with plans to build a 25,000 km of HSR system by 2020. Since then the pace of development was truly mind-boggling. 38 months after first starting construction on the Beijing-Shanghai line in April of 2008, the first train left the station. 1,318 km long, the line had an army of around 130,000 workers working on it constantly from start to finish. Speed & Efficiency – As the name suggests the HSR system allows for quick transit times in what would be an otherwise grueling journey between a large number of its economic centers. The rail system is also highly efficient and famed for its punctual departure and arrival times. Population Density – China’s huge, dense population and growing affluence ensures there is appropriate demand to justify the system’s expansion. Value – Although HSR is still too expensive for many Chinese, and still represents a luxury form of travel, it is cheaper than air travel, and provides much better value for much more affluent Chinese. Convenience – The majority of the HSR systems and stations are well located in central areas of the cities allowing for a high level of convenience, with little onward travel time to business and touristic areas of cities. Long-term sustainability – From a usage standpoint, rail is definitely the more sustainable alternative to air and automotive travel. The most important advantage here is that HSR trains are run on electrified lines, meaning they are not directly supported by fossil fuels, but can instead be run by a mix of more sustainable energy options. Ridership numbers have soared with the development of new lines and the linking of China’s 1st and 2nd tier cities have allowed benefits to their economic structures. In the 90s a trip from Shanghai to Hangzhou, one of Jiangsu’s most prosperous cities and home of Alibaba, could take over 4 hours, with the addition of HSR the journey time is cut to as little as an hour, allowing business to thrive and economic and social exchange between the two cities to prosper. Just one of many examples where strong city linkages have allowed for greater investment and citywide development. A measure of China’s engineering success is the planned export of its technologies abroad to areas such as the US, Turkey, and Japan and provides examples of the international recognition of domestic technological achievements. One specific example is the joint venture between China’s HSR companies and XpressWest, a Nevada based venture, to build a high speed linked between Los Angeles and Las Vegas. This will reduce transit time and no doubt bring greater economic links between the two US cities. Based on case studies conducted on multiple larger lines, we can see that the main age group riding HSR is 25-55 years old. Within this group the white-collar worker is the most represented whilst lower income groups chose the slower more traditional train systems. This contrast is most stark at Chinese New Year when “slow-train” stations are packed with blue-collar factory workers, whilst at HSR links more affluent cliental are observed. Although individuals with a relatively large spectrum of incomes ride, the majority of people are in the upper quintile. HSR passengers’ incomes were around 35-50% higher than conventional rail passengers. Why, how and when are they using it? For those that can afford the increase in fare from conventional lines to HSR, they do so for “comfort,” “convenience,” “punctuality,” and “safety.” For many people the reasons for use were business, pure travel/tourism and to visit family and friends. As business moves and families split the high – speed links become more and more important to the average citizen. According to our research, there is a greater preference for HSR over air travel. Despite the reduction in transit time when flying major issues with delays occur with air transport and the average consumer prefers the high levels of frequency, efficiency, comfort, and reliability afforded to them by HSR. In fact, the rise of HSR has caused regional flights in China to lower prices, and, in some cases, cease entirely. In general, it has caused an increase in competitiveness for all modes of transportation. 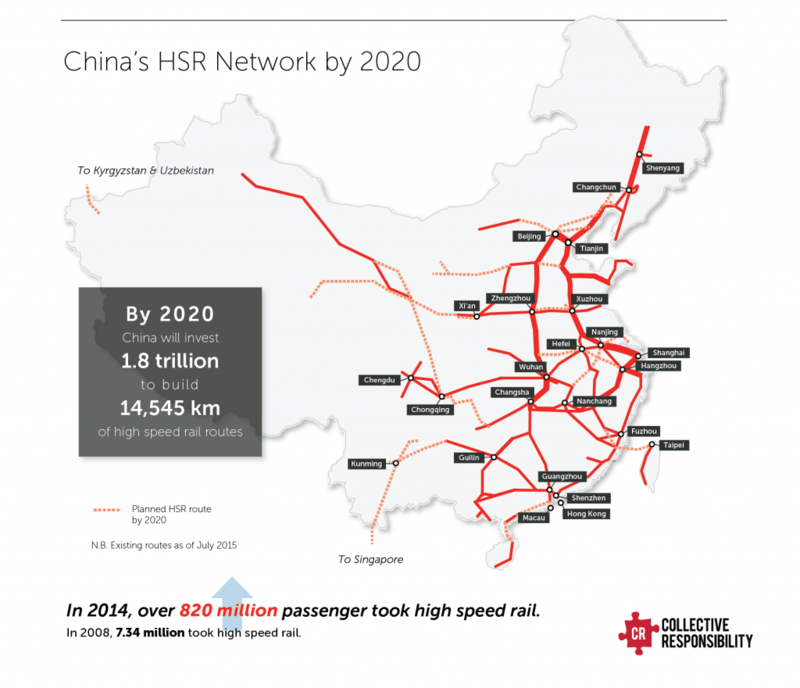 With so much success and economic development aided by the development of HSR, as we move towards an urban billion and an increasing number of cities housing 1 million residents, HSR will continue to be vital to the 3rd and 4th tier cities as they look to achieve the economic success of China’s 1st tiers. Investment in the Center and the West is planned (see map above) and the first HSR in Xinjiang province was completed in 2014. 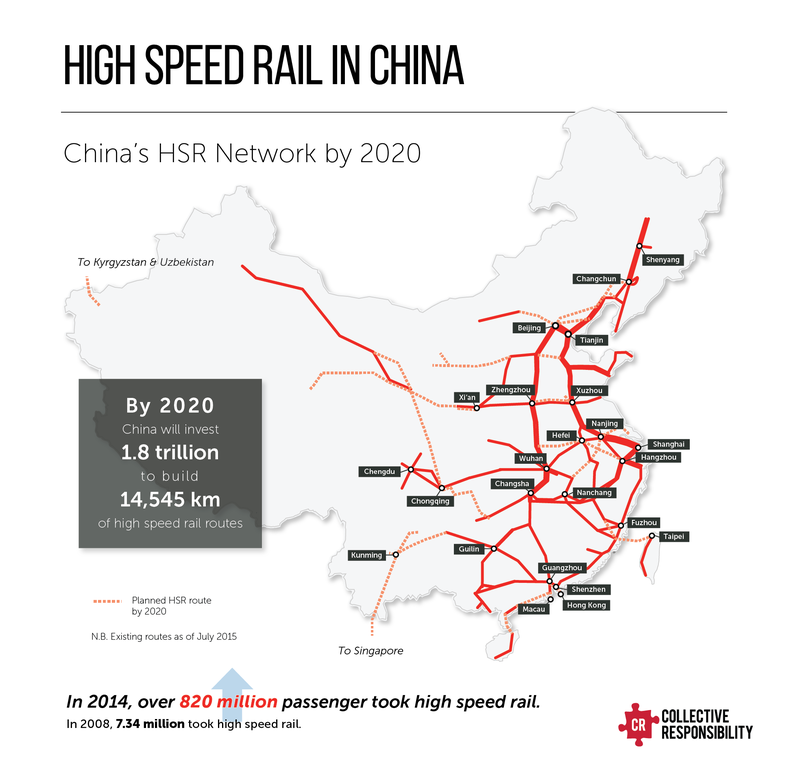 Developing hyper-connected routes within China is a key aspect of sustained development and HSR has a considerable role to play. As China shifts from an investment-led economy to one that is tertiary and consumption led affluence will drive greater demand levels and expected individual mobility will increase. With the engineering experience, technological development and infrastructural decision making available to China the continued construction of lines is more achievable here than perhaps any other country in the world and as a result, HSR development should be expected well into the next decade. This article was written by David May & Rachel Sorenson, Research Analysts at Collective Responsibility. Who would have just a few tyears ago that HSR play such a big role in trasportation? The Chinese were the builders of Western end of our American transcontinental RR and were forgotten immediately. Now Chinese built HSRs is impacting the world. No one predicted this!